Calcium supplementation is a topic that continues to plague the community of chameleon owners, breeders, and enthusiasts. How much do we give? How often do we give it? Do we give it with or without vitamin D3? Do we have to give it in addition to a multivitamin? and on, and on.... There doesn't seem to be any real consensus. If you ask different successful breeders and enthusiasts, you may get significantly varying opinions on how to supplement. Additionally, what works for one chameleon owner could be certain death for another owner's chameleon. In the following article I will "attempt" to explain a number of variables in the metabolism of calcium that may help a keeper determine their own supplementation protocol. Please Note- There is no way to completely cover this subject in one article. At best, this is a starting point for understanding calcium and supplementation thereof. This article will discuss 1) general facts and terminology, 2) how calcium is absorbed and how D3 is synthesized/acquired, 3) what nutritional secondary hyperparathyroidism and renal secondary hyperparathyroidism have to do with this, and 4) the potential for hypercalcemia and the possible risks/consequences for over supplementation. Roughly 2% of a chameleon's weight is made up of calcium. Bone is the most commonly recognized source. However, about 1% of body calcium is found outside the bone and is a very active player in various and important body systems. Heart function, nerve conduction, muscle contraction are only a few systems dependent on stable levels of calcium. (Actual reference ranges will/may vary from species to species, though the ratio will be roughly the same.) Calcium in the blood serum has two forms: ionized and unionized. Ionized- This is the biologically active form. It is circulating and available for use. Unionized- This is a form that is already bound to other complexes (primarily proteins (albumin) in the blood.) Total serum calcium is roughly 50% ionized and 50% unionized. It is important to note that many factors may be involved in getting a correct reading of these levels. For instance, if albumin is low, there may be a lower unionized ratio of calcium, and a higher ionized form. If pH is high, it will decrease the ionized form. Vitamin D3 is essential for one form of calcium absorption while estrogen helps to maintain calcium levels. We also know that stress and old age lower calcium absorption. The point is that a myriad of dueling chemical systems make it hard to establish normals for chameleons in general, let alone, subspecies and regional differentiations. Add to this the fact that we don't know how much calcium will be absorbed by a particular chameleon. Some species absorb what's needed and excrete the rest without ever absorbing the unneeded portion. Some chameleons absorb extra calcium and excrete what is not needed by way of the gall bladder and urinary systems. Some chameleons excrete calcium solely by way of the urinary system. Summary- Lots of factors affect the metabolism of calcium. Since each chameleon is unique in this respect, the owner will have to tailor a specific supplementation protocol to fit that particular chameleons needs. In order to understand the main concepts of supplementing calcium, it is important to discuss Vitamin D3 in its relation to UVB lighting. How is Vitamin D3 synthesized / acquired? b) consuming a vertebrate that synthesized the hormone through exposure of the sun. The production of vitamin D3 occurs as a result of the photosynthetic conversion of 7-dehydrocholesterol to pre-vitamin D3 (UVB represents the range of light considered important for synthesis of D3.) Pre-vitamin D3 is converted to vitamin D3 via a temperature dependent process. At this point the hormone is transported to the liver where it is hydroxylated to 25-hydroxyvitamin D3. The kidneys serve as the site for the final conversion of the hormone to its active form 1,25-hydroxyvitamin D3 (Calcitriol). Why is Vitamin D3 important and how does it relate to calcium? Vitamin D3 is an essential hormone that plays many different important physiological roles. Its role in calcium metabolism is probably its most recognized function. Vitamin D3 stimulates intestinal absorption of both calcium and phosphorus, thus causing a rise in blood serum calcium and phosphorus concentrations. Without vitamin D3, ingested calcium would not be accessible to the body. The parathyroid is an endocrine organ that regulates the production of parathyroid hormone (PTH). PTH is important to this discussion because it maintains serum calcium within normal limits by affecting bone resorption, renal calcium excretion, and metabolism of vitamin D3. What do we need to know about the parathyroid? If circulating serum calcium levels are low, the parathyroid turns on production of PTH and in turn, vitamin D3 is secreted by the kidney. PTH stimulates osteoclastic activity (break down of bone) to put the calcium and phosphorus in the blood. Vitamin D3 stimulates the intestinal absorption of BOTH calcium and phosphorus, thus raising both serum concentrations. PTH also stimulates the kidneys to increase excretion of phosphorus without loosing the calcium. This is important because D3 increases phosphorus absorption in the gut and PTH causes the breakdown of bone, also increasing phosphorus levels. 3) What do nutritional secondary hyperparathyroidism and renal secondary hyperparathyroidism have to do with this? Most owners call all calcium deficiencies Metabolic Bone Disease (MBD). This is actually an incomplete term as there are many ways bone disease can be affected by metabolic pathways. The ones that concern us are nutritional secondary hyperparathyroidism and renal secondary hyperparathyroidism. NSHP is when there is an excessive production of parathyroid hormone (PTH) due to low serum calcium. Either there was 1) no available calcium in the diet, or 2) no available vitamin D3 to stimulate intestinal absorption. Regardless, no dietary calcium is absorbed into the bloodstream. Since no calcium is readily available for intestinal absorption, calcium is resorbed from the bones. Consequences are weakening of the bones with secondary breaks and abscesses. Since calcium is also required all over the body, weakness, tremors, anorexia are also problems. RSHP is a consequence of renal disease and lost kidney function. Remember- the kidney (among other things) was supposed to 1) synthesize D3 and 2) respond to PTH and excrete excess phosphorus. Problem- No D3' No absorption of calcium; No D3' the parathyroid continues to stay on to stimulate production of D3. Increasing levels of PTH continue to 1) break down bone and 2) intestinally absorb calcium and phosphorus, but now can't get rid of the phosphorus because of decreased kidney function. Consequences- if mild, metabolic bone degeneration and continued destruction of the kidneys. Hyperphosphatemia and hypercalcemia unchecked will both cause death. 4) How do diet and supplementation tie into all of this information? b) A variety of food sources like their natural habitat. All nutrients and calories needed for growth, maintenance and reproduction. That is not how it is however; so, the ultimate question is how much and of what? Hopefully, by now, it is apparent why it is not that simple. UVB lighting- UVB either comes from the sun or appropriate lighting. Optimal situations would provide natural sunlight. (Remember, glass filters UVB). However, since this may not always be an option, artificial sources of UVB may be used. If sufficient UVB lighting is offered, this is a big step in naturally preventing MBD in a reptile housed inside. With the tubes and bulbs offered now a days, natural synthesis of vitamin D3 is the safest way of regulating calcium absorption. This assumes 1) there is adequate calcium in the diet, and 2) the bulb used is close enough for the animal to utilize and does not have significant burn out that causes less than optimal exposure to UVB. Some experts might suggest under these circumstances, that supplements might not be necessary. Food items- Variety is more readily available these days, but still does not simulate the variety in the wild. Additionally, some of the staple feeders used are not adequate in the calcium:phosphorus ratios. (Remember- should be 2:1) Crickets, mealworms and superworms are actually the opposite ratio. Pheonix worms and butter worms are good in ratio, but too high in fat. This ratio in staple insects may be overcome by appropriate gut loading with appropriate legumes and greens and various formulated feeds. (Certain diets high in calcium may cause gut impaction in crickets.) If not, it may be necessary to supplement. Supplementation- The jury is still out on the amount needed and the interaction between all the minerals and supplements. Do keep this in mind though: Chameleons use calcium according to their metabolic rate. Thus lowland species tend to require more calcium than montane species because they are maintained at warmer temperatures and have higher metabolic rates. Faster growing chameleons need more calcium than slow growers. Females with larger egg mass require more calcium than barren females or low producers. As a general rule, as calories intake increases, so should calcium intake. Calcium with D3- If you have adequate UVB (by bulb or unfiltered natural lighting), calcium with D3 may not be necessary. Unfiltered natural lighting- Animals that are outside in the sun more than 45 minutes a day should not be supplemented D3. The body will already be maximally generating its own D3. If D3 is consistently given dietarily, the pituitary will not be able to regulate calcitriol (active D3) that quickly and spikes of hypercalcemia will most probably occur. Over time, hypervitaminosis D and hypercalcemia will cause clinical signs of soft tissue calcification, depression, anorexia, excessive drinking, urination, and weight loss. UVB lighting- There is probably some argument for supplementing D3 occassionally with animals only provided UVB lighting. Due to the narrow scope of some UVB bulb, evidence of varying burn-out times on UVB bulbs, and tendencies of the reptiles to not bask close enough to the bulbs, supplementation could be helpful. With occasional supplementation of D3 and artificial lighting, the body will most likely be able to regulate D3 production preventing hypervitaminosis D while decreasing the chance of hypocalcemia. So, how good do you feel about your UVB bulb? If your bulb is no good, or your reptiles refuse to bask close enough for it to be effective, maybe vitamin D3 is for you. If your UVB is good, and your reptile uses it appropriately, maybe vitamin D3 may still be for you in small amounts, or not needed at all. Calcium without D3- If the UVB is working, the ideally the body will take only what is needs. However, excess dietary calcium by itself may inhibit the absorption of other trace minerals. Too much is still not good. Wrap Up- There is no easy answer. Try to understand how your individual reptile's body systems work. Try to factor in varying restrictions that your reptile will encounter (environmental, metabolic, financial, availability, others.) Then, shoot for a happy medium to "hopefully" get your chameleon enough but not too much of what he or she needs. -nutritional deficiency- prey or food with an inadequate calcium level. -impaired absorption- calcium absorption may be impaired by phylates (like soy ingredients), oxalates (like spinach), high fat pet foods, acidic foods. -nutritional imbalance- inappropriate calcium to phosphorus ratio in the food eaten. -renal compromise- kidneys are not working. -inadequate lighting- lack of UVB to convert D3 to active form. -muscle tremors, spontaneous bone fractures, inadequately calcified eggs. -primary hyperparathyroidism- parathyroid tumor causing excess secretion of PTH. -nutritional imbalance- foods rich in calcium (rare). -bone resorption- bone infection or cancer. -Maximal calcium tolerances are likely 3-5 times corresponding minimums. Higher intake may lead to conditioned deficiencies of trace minerals combined with high- fat diet, formation of calcium soaps in the digestive tract. -calcification of the heart and kidney, bone resorption, and secondary nutritional hyperparathyroidism. -soft tissue calcification, depression, anorexia, polyuria/polydypsia (excessive drinking / urination), and weight loss. Dr. Donoghue- Chameleon News, On-line E-zine. May 2002. Dr. Mader- Reptile Medicine and Surgery. 1996. Drs. Feldman and Nelson- Canine and Feline Endocrinology and Reproduction, 3rd edition. 2004. 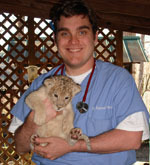 Dr. Wheelock is a small animal and exotic veterinarian in Charlotte, NC. He is a 2002 graduate of Louisiana State University School of Veterinary Medicine where he was keeper for LSU's live tiger mascot and a co-chair for the LSU Wildlife and Raptor Rehabilitation Unit. He did a preceptorship with the Baton Rouge Zoo before graduation, but now can be found as Chief of Staff at Harris Blvd Veterinary Clinic in north Charlotte. He has a special interest in herpetology and herp medicine and presently provides veterinary support for the Metrolina Wildlife Park (reptile house).